A short while ago, I had written not very favorable review about the Soul Food (see my review here). The Soul Food was an Electro-Harmonix' take on the famous Klon Centaur overdrive, and to me it was a huge dissapointment. I really couldn't understand, why everyone was so excited about it. I eventually ended up selling the Soul Food and obtaining the real thing. But my Klon is not the Klon per se. It's a clone of the Klon. And the best part of the story is that I have built it myself! I am not trying to show off here. What I am trying to say is that building your own effect pedal of the boutique quality is fairly easy. If you happen to have basic soldering skill, you are good to go. The whole design of Klon Centaur has already been reverse-ingeneered a while ago, so its exact schematic is no secret anymore. The secret are the specs of clipping diodes used to achieve the required tone character. People have tried all sorts of diodes in the circuit, and found that the Russian D9E diode was an exact tonal match. Luckily, these diodes are still being sold on eBay. The other parts of the build are pretty common and could be sourced from almost anywhere. I recommend to purchase the PCB (Printed Circuit Board) from AionElectronics.com. 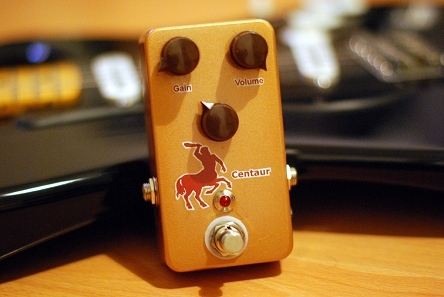 The Refractor project found there is a straight-up replica of the Klon Centaur. Check the project's documentation for more info. It helps to bust a few myths and clear up some misconceptions too. Highly recommended! If you are a beginner, you may find these tips useful. I'd recommend getting your PCB from AionElectronics.com. All projects of this guy are very well documented and therefore most suitable for the beginners. I got my pair of D9Es at eBay (a Bulgarian stock). You shouldn't be worried doing the same. Watch a soldering lessons on Youtube. Soldering is really not that difficult and with some practice it will become your second nature.